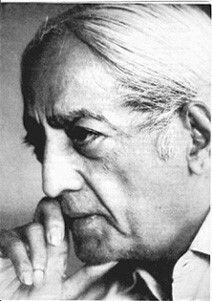 Krishnamurti: Let us look at the problem widely and intelligently. I am not denying God – it would be foolish to do so. Only the man who does not know reality indulges in meaningless words. The man who says he knows, does not know; the man who is experiencing reality from moment to moment has no means of communicating that reality. Belief is a denial of truth, belief hinders truth; to believe in God is not to find God. Neither the believer nor the non-believer will find God; because reality is the unknown, and your belief or non-belief in the unknown is merely a self-projection and therefore not real. I know you believe and I know it has very little meaning in your life. There are many people who believe; millions believe in God and take consolation. First of all, why do you believe? You believe because it gives you satisfaction, consolation, hope, and you say it gives significance to life. Actually your belief has very little significance, because you believe and exploit, you believe and kill, you believe in a universal God and murder each other. The rich man also believes in God; he exploits ruthlessly, accumulates money, and then builds a temple or becomes a philanthropist. Is belief in God “a powerful incentive to better living”? Why do you want an incentive to better living? Surely, your incentive must be your own desire to live cleanly and simply, must it not? If you look to an incentive you are not interested in making life possible for all, you are merely interested in your incentive, which is different from mine – and we will quarrel over the incentive. If we live happily together not because we believe in God but because we are human beings, then we will share the entire means of production in order to produce things for all. Through lack of intelligence we accept the idea of a super-intelligence which we call `God; but this `God’, this super-intelligence, is not going to give us a better life. What leads to a better life is intelligence; and there cannot be intelligence if there is belief, if there are class divisions, if the means of production are in the hands of a few, if there are isolated nationalities and sovereign governments. All this obviously indicates lack of intelligence and it is the lack of intelligence that is preventing a better living, not non-belief in God. You all believe in different ways, but your belief has no reality whatsoever. Reality is what you are, what you do, what you think, and your belief in God is merely an escape from your monotonous, stupid and cruel life. Furthermore, belief invariably divides people: there is the Hindu, the Buddhist, the Christian, the communist, the socialist, the capitalist and so on. Belief, idea, divides; it never brings people together. You may bring a few people together in a group but that group is opposed to another group. Ideas and beliefs are never unifying; on the contrary, they are separative, disintegrating and destructive. Therefore your belief in God is really spreading misery in the world; though it may have brought you momentary consolation, in actuality it has brought you more misery and destruction in the form of wars, famines, class divisions and the ruthless action of separate individuals. So your belief has no validity at all. If you really believed in God, if it were a real experience to you, then your face would have a smile; you would not be destroying human beings. Now, what is reality, what is God? God is not the word, the word is not the thing. To know that which is immeasurable, which is not of time, the mind must be free of time, which means the mind must be free from all thought, from all ideas about God. What do you know about God or truth?, You do not really know anything about that reality. All that you know are words, the experiences of others or some moments of rather vague experience of your own. Surely that is not God, that is not reality, that is not beyond the field of time. To know that which is beyond time, the process of time must be understood, time being thought, the process of becoming, the accumulation of knowledge. That is the whole background of the mind; the mind itself is the background, both the conscious and the unconscious, the collective and the individual. So the mind must be free of the known, which means the mind must be completely silent, not made silent. The mind that achieves silence as a result, as the outcome of determined action, of practice, of discipline, is not a silent mind. The mind that is forced, controlled, shaped, put into a frame and kept quiet, is not a still mind. You may succeed for a period of time in forcing the mind to be superficially silent, but such a mind is not a still mind. Stillness comes only when you understand the whole process of thought, because to understand the process is to end it and the ending of the process of thought is the beginning of silence. Only when the mind is completely silent not only on the upper level but fundamentally, right through, on both the superficial and the deeper levels of consciousness – only then can the unknown come into being. The unknown is not something to be experienced by the mind; silence alone can be experienced, nothing but silence. If the mind experiences anything but silence, it is merely projecting its own desires and such a mind is not silent; so long as the mind is not silent, so long as thought in any form, conscious or unconscious, is in movement, there can be no silence. Silence is freedom from the past, from knowledge, from both conscious and unconscious memory; when the mind is completely silent, not in use, when there is the silence which is not a product of effort, then only does the timeless, the eternal come into being. That state is not a state of remembering – there is no entity that remembers, that experiences.